What’s better than a pumpkin pie? How about one you can hold in one hand and eat on the go! These pumpkin hand pies are a delicious way to eat your pie any time, anywhere. Hand pies are a favorite around my house. I used to make a batch of them and bring one with me to work every day as a little treat for myself at lunch. I wasn’t in love with my job so little pick-me-ups like that meant a lot to me. I think one of my favorite hand pies is hands down the pumpkin hand pies. I would bring some whipped cream with me and really give myself a treat in the break room. Usually on pumpkin hand pie days, I’d have to bring an extra pie for my pumpkin-obsessed co-worker! 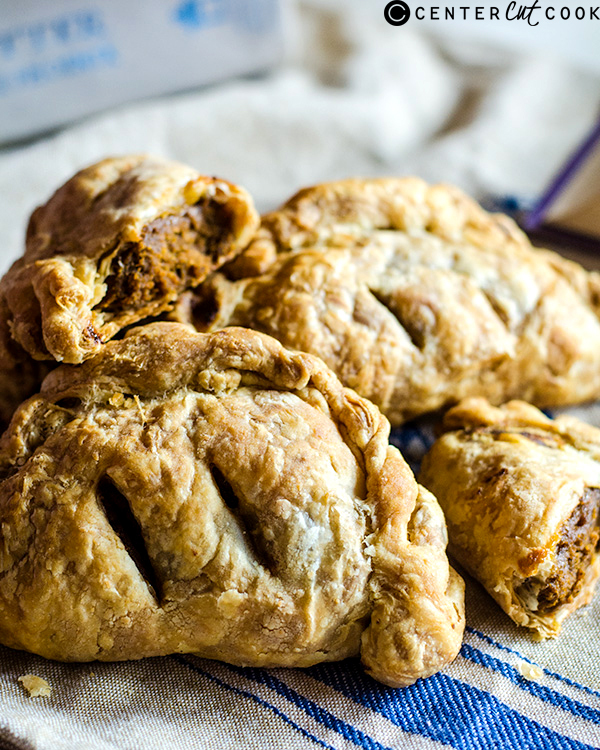 I’m going to be honest with you and tell you one of the reasons why I love it is because it does remind me of the pumpkin pasties in the Harry Potter books. 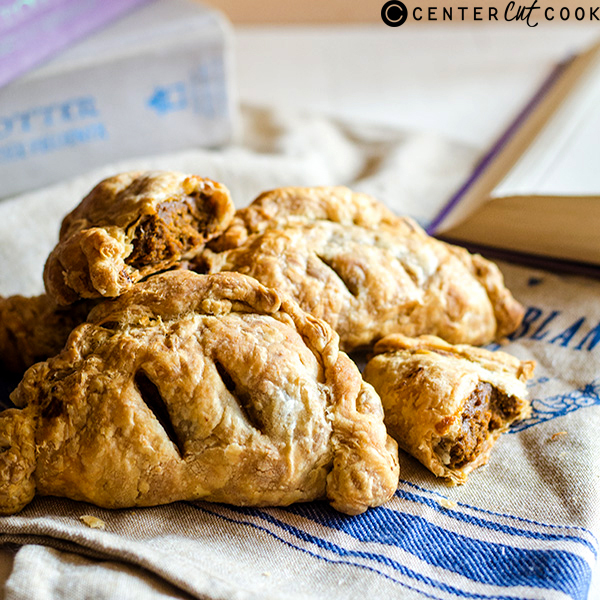 While these are similar, they are definitely different from your regular pasty because we are cheating and using puff pastry for these pumpkin hand pies. But if you happen to know how to make the pastry dough for pasties, then use that because it’s so delicious! This recipe is easily doubled and even tripled! All you need to do is increase the initial baking time to firm up the mixture more. It’s a bit of a pain to do, but the filling is just too liquidy without that first bake. This firms up the filling enough to make it spoonable (I know it’s not a word, but it should be!) and makes the whole rolling the pastry that much easier! The filling should be still be a little jiggly, but firm enough to hold its shape. So put down the fork and wash your hands because we are about to dig into some pumpkin hand pies! In a small bowl, mix together the pumpkin, evaporated milk, egg, sugar, pumpkin pie spice, vanilla extract, and salt together. Pour into a small oven-safe container (I used a 6-inch cake pan) and bake for about 15 – 20 minutes. We want it to cook just a bit so it is firm enough to handle, but not totally cooked. It should still be jiggly in the middle. Remove and cool. Reduce the heat to 350 degrees F.
Roll out the puff pastry and divide each sheet into quarters. Evenly distribute the filling in the centers of the puff pastry and seal the edges, then roll up the edges to ensure the filling doesn’t escape. Use a fork to crimp the edges if desired, Create two slits on the top of each pastry. Place the pastries on a parchment-lined baking sheet and bake for 20 – 25 minutes, or until the tops are golden brown.